I need help! I have a 1997 Ford Taurus that sometimes will not shift out of park! I have looked it up online and have found that it says I need a new brake indicator switch, then I saw that I need a new park brake release switch and then I went into Autozone and they told me another part! Can someone please tell me what part I need to fix my problem?? Have you checked to see if the brakes lights are coming on when this happens? No, I have not but did have problems with the brake lights not working when I originally bought the car. Could that be the problem? Why don't you find out then? The next time it does it I can look, it's not a constant problem every time I start my car. OK, then something is going on with the brake light switch. It could be bad or just getting stuck. I know this post is from a while ago but the problem stopped and now it is back. I took it to firestone and was told I need an entirely new steering column. I looked at it and one of the wires that is supposed to connect to the brake light switch has disconnected. I attempted putting it back where it was supposed to go but that is not solving the problem. I am wondering do I really need a whole new steering column or is there another option out there? Any advice is greatly appreciated! There is a solenoid in your column that will not allow you to shift out of park without the brake being applied. Since your brake light switch has damaged wiring, the car does not know you have your foot on the brake. Going to Firestone is fine if you need tires. As you see, they missed a very easy diagnosis. You need a new pigtail for the brake light switch. Get the wiring to the switch repaired. You would be wasting money changing the column. Are you able to take a pic of the part you are looking at and post it here? Use Photobucket, it works well on this site. Then we are all on the same page and can better help you. Its ok to revisit an older thread when it is your thread and you have not fixed to old issue. We do appreciate that when this is fixed that you follow up with what the fix was. A lot of people search the archives daily and finding what you found wrong on your car can help them in fixing their car. Also, when you need diagnostic work in the future, please try to avoid chain stores. As you can see, they usually do not have the kind of experience in electrical diagnostics that a competent independent shop or dealership will have. Their door rate may be cheaper, but following their advice would've had you throwing hundreds of dollars into a new column you didn't need instead of fixing a simple wiring issue. Thanks for the advice!! I did go there for tires and figured they would know better than me so had them check but I have learned my lesson on doing that! 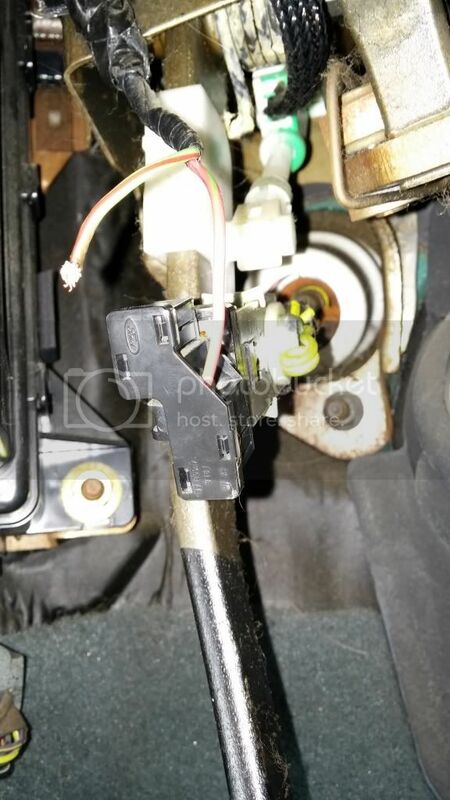 Below is an image I took off the switch and wiring, is this something I need to go to a mechanic for or would I be able to fix it myself? You're going to need a replacement plug to splice into that harness. It's called a pigtail and replace the switch at the same time. You guys were right!! Just needed a new pigtail! Took it to the dealership and they fixed it for 130 when firestone told me it would be about 700-800!! Thank you!